Just about everyone in the United States (and probably many other countries) was aware of the total eclipse on August 21st of this year. Nancy and I had the privilege of seeing the total eclipse in the foothills of the NC mountains. We are so thankful that Abba blessed us with that once-in-a-lifetime experience! I have always been fascinated with YHVH’s created heavenly bodies, so I could not resist this opportunity to see one of the many heavenly testimonies to His awesome glory and power. Since I had never seen anything but a partial eclipse (and that was as a young child), I did not really understand the unique qualities of a total solar eclipse. I thought of all the amazing factors that have to come together for the moon to track right along with the sun across 3,000 miles of our country, blocking the entire sun within a 30-mile-wide swath at the surface of the Earth. One of the things that YHVH planned and designed perfectly were the relative sizes of the Sun and Moon, and the distances between the Sun, Moon and Earth. This would be straightforward if the three heavenly bodies were all close together, but it is complicated by the fact that the moon is only 250,000 miles from the Earth and is ¼ the size of the Earth, while the Sun is 93 million miles from the Earth and over one million times the size of the Earth. Another aspect is the perfect alignment of these three bodies by the synchronization of their orbits around each other: the moon around the Earth and the Earth around the Sun. To make this even more miraculous, this blocking of the Sun must be able to persist for a very long time, such as the tracking of the total eclipse across the entire US on August 21st. 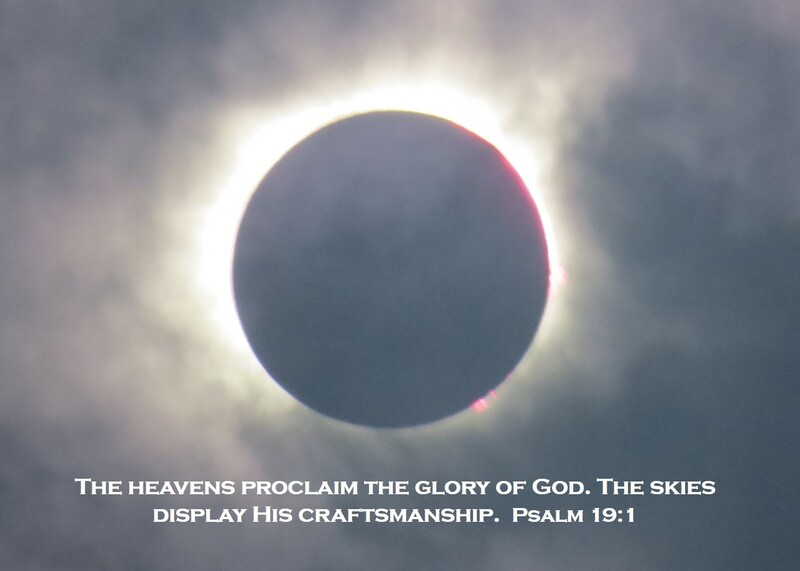 During the total eclipse, we marveled at Abba’s amazing creation, demonstrating His glory and perfection through this incredible event. When the eclipse became total and darkness fell all around us, it was almost beyond description – even the birds were confused by this sudden darkness and flew anxiously back and forth out of the surrounding trees. The photo at the front of this article, taken with a regular digital camera by one of my cousins, gives you some idea of the incredible view we had of the sun, looking at it with our naked eyes. Once darkness fell, we immediately started seeing other lights in the sky. The brightest and most obvious light was Jupiter, located to the East of the darkened Sun. A few of the younger folk in our group spotted another light to the West of the Sun, and we later discovered that it was Venus, often called the “morning star”. I did not learn until later that the only time you can see both Jupiter and Venus in the sky is during a total eclipse. At all other times, Venus can be seen in the morning and Jupiter can often be seen in the evening sky. It is hard to describe if you have never experienced anything as visually amazing as a total eclipse, but at this stage our whole group was staring in awe at the darkened sun, and we were rendered speechless – it was a truly inspiring sight, and showed us YHVH’s glory from a very different perspective. At the time, I was thinking about the significance of seeing Jupiter in the eclipse-darkened sky in the middle of the day. I remembered that the original Hebrew name of Jupiter was Melech, which means king. Then I recalled that this planet symbolized the Messiah as the King of Kings according to ancient Rabbinic interpretations of Messianic prophecies. Later, we remembered that the Sun also represents Yeshua our Messiah (Psalms 19:4-6). Although the Sun was darkened for a time, it could not be blotted out completely, because the corona was still visible around the perimeter of the moon. Also, as the Sun darkened, Jupiter brightened. Our Messiah and King, the Light of the world, cannot be defeated. While I do not predict timelines of the Second Coming, I feel that Yeshua was giving us some very powerful visions of His final victory on that darkened afternoon. I believe He was telling us that He is coming quickly (as He said in Revelation 22:12), understanding that “quickly” in His time-frame means something very different than it does from our Earthly perspective. It was another sign to me that we need to prepare ourselves spiritually for His second coming. We can best prepare ourselves through worship, fasting and prayer, as He meets us at those times and gives us revelation about Himself and His plan. I praise Yehovah’s holy Name that He gives us these glimpses into His glory. Let us turn our hearts and minds to Him and listen for His voice so that we do not miss what He wants to place in our hearts. Even though darkness (evil) on the Earth will increase for a while, it will not totally blot out the Light of the world, who has already overcome the world (John 16:33). Yeshua, our Light and King, will very soon return to the Earth, triumphant over the evil one.